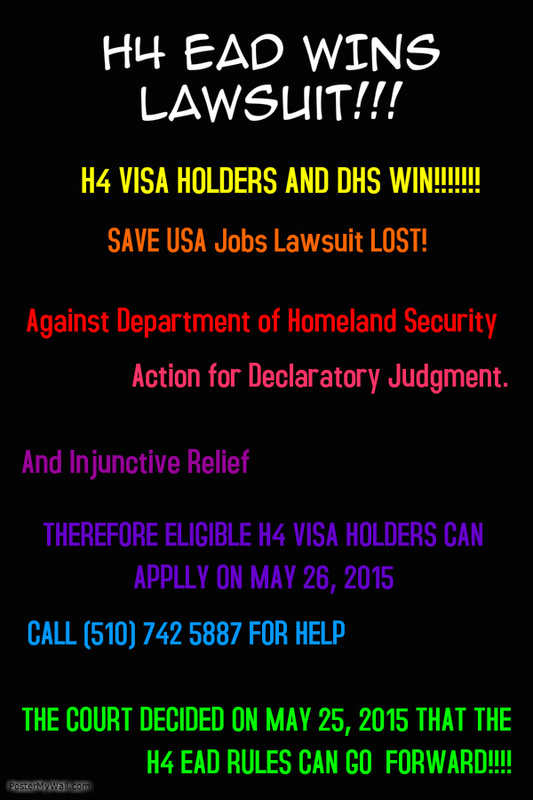 H4 Work Authorization, Work Permit or H4 EAD and H4 Visa Issues: Plaintiff on lawsuit against H4 EAD seems not to be giving up! 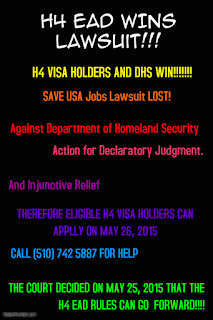 Plaintiff on lawsuit against H4 EAD seems not to be giving up! A tech industry worker group urged a D.C. federal court Tuesday to keep alive their challenge to a new U.S. Department of Homeland Security H-4 visa rule that allows certain spouses of high-skilled immigrants to get work authorization, saying the department wrongly argued that they didn't properly plead an injury." Seems that their argument is that the government argument that Save Jobs USA did not "properly plead an injury"was erroneous. Although I will agree that the Department of Homeland Security could have done a better job on this matter, my analysis that Save Jobs USA did not actually show irreparable harm. They claimed that tech workers will be affected by this rule cannot really be substantiated. Most of the H4 visa holders who are going to be getting a work permit are probably not tech workers. Had they been tech workers, they would have shifted to H1B long time ago. Since we started the petition and pushing for the H4 EAD, I have spoken and written to thousands of H4 visa holders most of them were in business, art, medical and other areas rather than in the tech industry. If the court allows Save Jobs USA to bring back their lawsuit, it will create a very bad precedence for the legal system. As such we urge the court not to reconsider the motion to re-open the lawsuit.